I think I’ve talked about our adventures in cake-tasting and the beautiful but epic fail of a wedding cake that came out of them. Thinking of that 100 degree day in San Diego combined with the smell of buttercream across many bakeries still make me cringe a little. Let’s say the average wedding cake tasting consists of seven samples. If my memory holds true, we visited four bakeries that faithful summer day. A little air arithmetic, carry the one and it comes to about 28 different taste tests. About a dozen samples in, my curiosity (and annoyance) got the better of me and I asked what the hell he was talking about. It only took nearly ten years to wonder, if “dee-lich-chus” cake was a flavor, what would it be? I decided a cake of this caliber would start with a buttermilk base. In to which roasted strawberries would be gently folded. 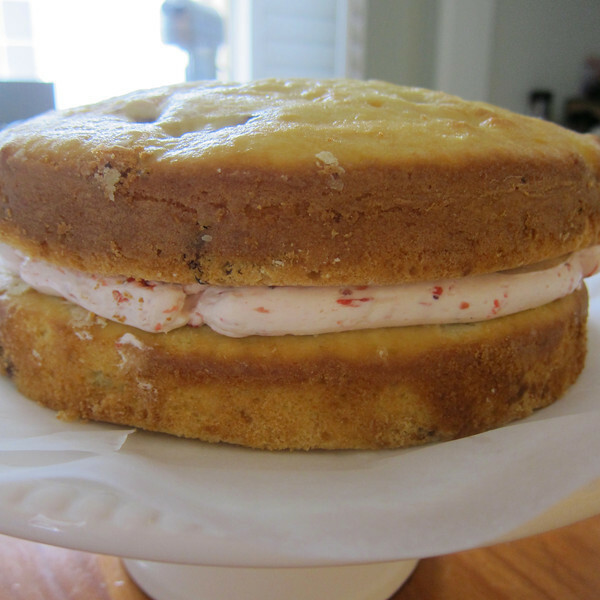 And accessorized with clouds of pillowy pink strawberry and balsamic buttercream. Stay with me here. Adding balsamic to strawberry is like adding coffee to chocolate. You don’t actually taste the extra ingredient, it just really enhances everything. And so was born dee-lich-chus cake. 1 C buttermilk, at room temp. Preheat oven to 350 degrees. Gently wash and cut strawberries into quarters. Place berries on a cooling rack, seeds-side-down over a sheet pan. Bake until strawberries are partially dried, about 45 minutes. Let cool, the chop (they’ll be sticky). Divide into 3/4 and 1/4 portions. Set aside 1/4 for the frosting. Grease (use your use butter wrapper) two 9-inch cake pans and set aside. Sift together the cake flour, baking powder, baking soda and salt. Set Aside. In a small bowl (I also like to use a 2 C pyrex liquid measuring cup), whisk together eggs and vanilla. 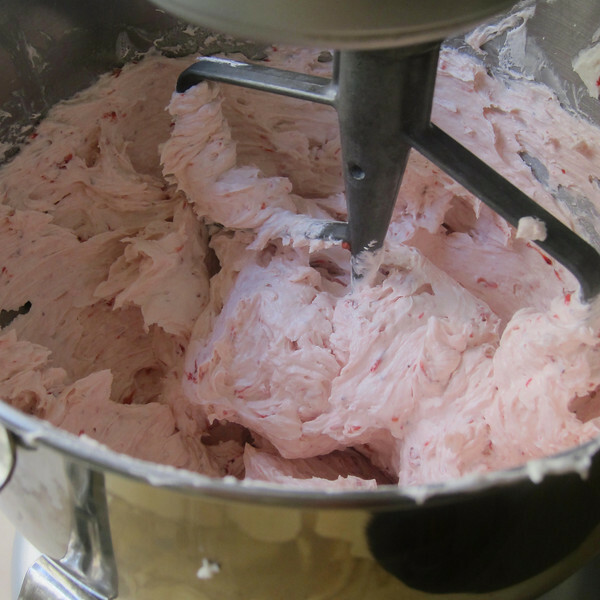 Using a mixer (standing or hand) on medium speed, beat the butter until creamy. Beat-in the sugar slowly over the course of 3-minutes. Beat- in egg-and-vanilla mixture one egg-at-a-time. Reduce speed on mixer to low and mix-in flour and buttermilk in three parts, beginning and ending with the flour. Gently fold-in strawberries by hand. Distribute batter into pans and bake in middle rack of oven for 25-30 minutes or until an inserted toothpick comes up clean. 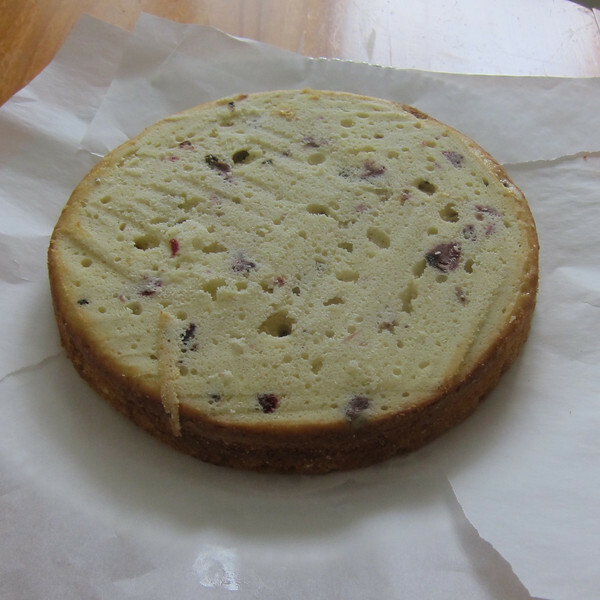 Once out of the oven, allow cakes to cool on rack for 10 minutes. Carefully un-mold and allow to cool completely. 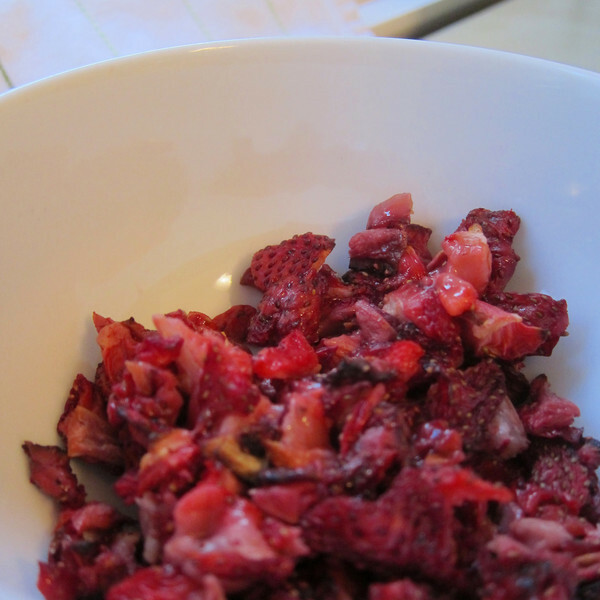 Add balsamic vinegar to reserved strawberries, puree mixture and set-aside. Attached the bowl to the stand mixer fitted with the whisk attachment. 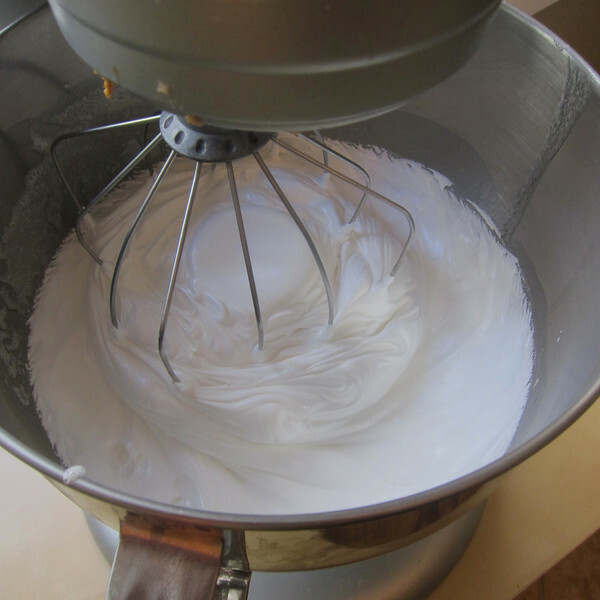 Starting on low speed, and gradually increasing to medium-high speed, beat until the mixture is fluffy and glossy and completely cool (you can tell by touching the side of the bowl). Process will take about 10 minutes. Switch to the paddle attachment. 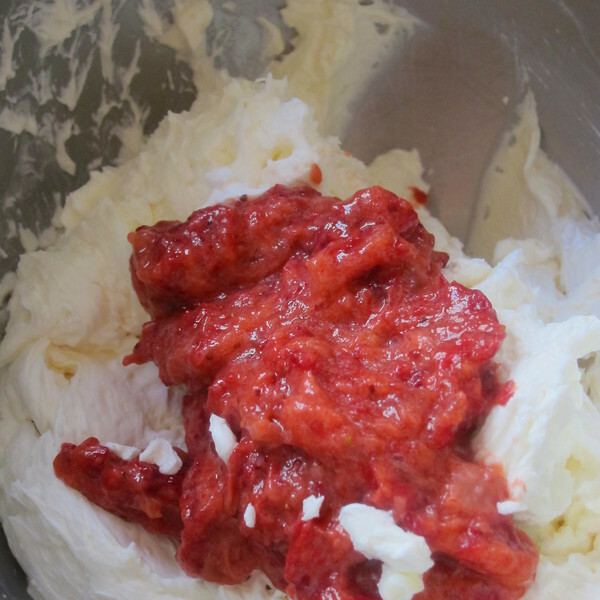 Add-in vanilla and strawberry puree and incorporate with paddle on low. 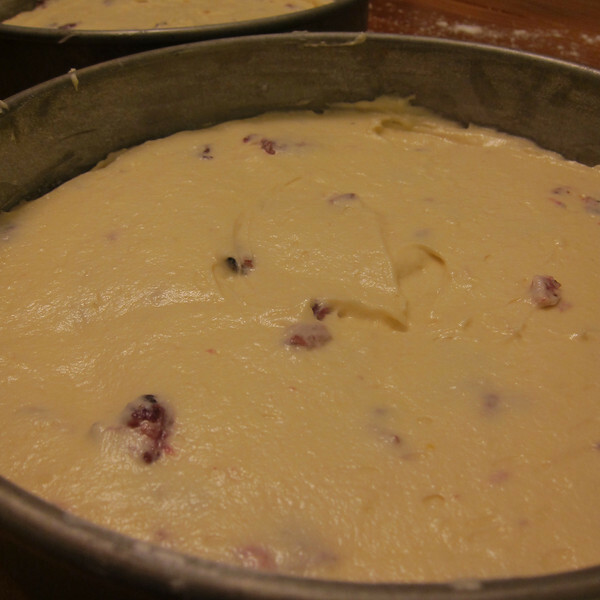 Scrape-down sides and mix until frosting is completely smooth. Frost cake as desired. Enjoy and try not to think about how much butter is in the frosting. This does look so delicious. 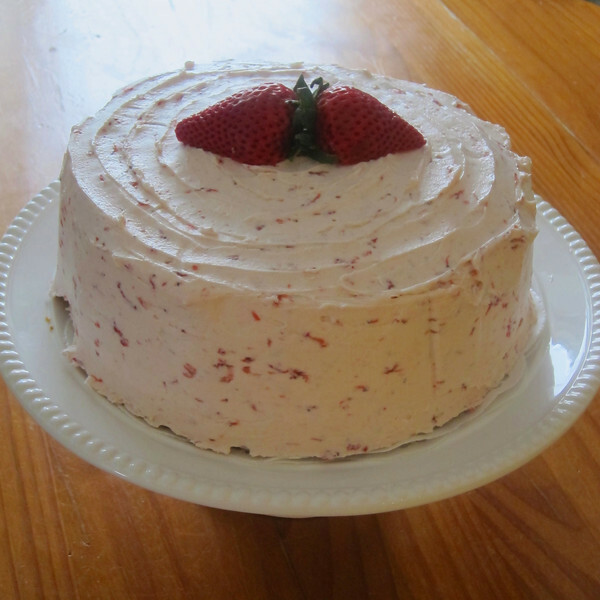 I need to make a strawberry cake for the little one’s birthday. Do you think this is a kid friendly recipe? Also, why can’t my frosted cakes look as beautiful as this? How did I miss your comment? I’m SO Sorry! 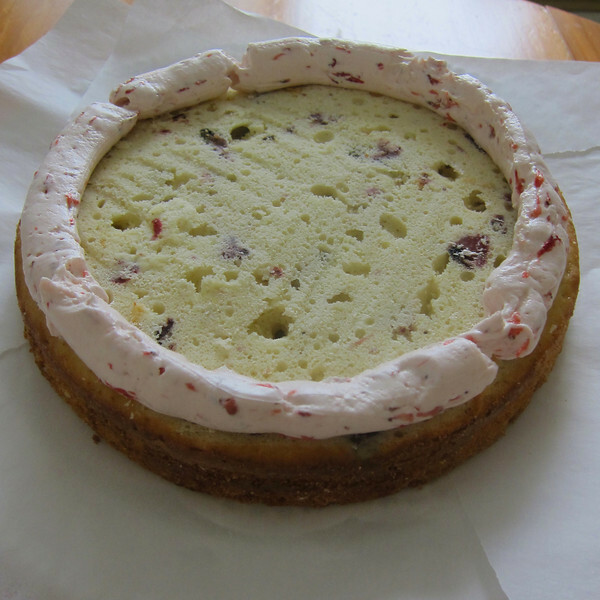 Somewhere along the way I learned that if you dip an offset spatula (or a regular table knife would work) into how water, whip it dry quickly and then run it over an already frosted cake, it will completely smooth-out the icing. 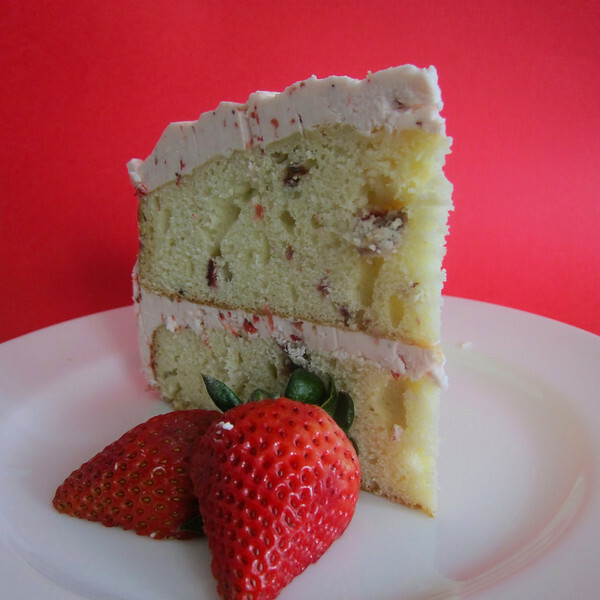 Just repeat until you’ve got your entire cake smoothed-out. Thanks for the cake decorating tip. Just wanted to let you know that I indeed made this cake the kid birthday, and it was a big hit. I did have a bit of trouble roasting the strawberries (they kept falling through and then burning on the pan below), but I know how to solve that problem next time. The cake itself was delicious, but the best part was the lighter than air frosting. Yum. Yum. Yum! Thanks for sharing.